Kudos goes to all the great people and things that are out there so here’s my list. NOTE ORDER is now going most recent first. 42. Creativity. It comes in a variety of ways, manners, items etc. Examples include expressive and funny peeps, interesting clothing (yeah for the Japanese wacky tshirts, leggings n layers! ), inquisitive exhibits, musicals, crafty hobbies, and books! 41. YouTube — The free-ish lifesaver for a gal w/o good tv options in a small VNese city….it’s my way to access Asian actors’ and espagnol soccer players’ commericals and to keep connected to my boy bands…me happy! 40. The rice cooker — When you’re sad and alone and there’s rice warm and yummy for your tummy (esp. w/some kim chi courtesy of your fantastic roommate), who would dare complain? 37. Cathy, my motorbike! She’s just so cute and so small and so red and so good! Cheaper than my snowboard but so much more useful! She’s my all-weather, lil engine that could! Go Cathy! 36. Facebook — I joined mid-June ’07 and I think I’m just uber addicted…what’s a talkative girl to do? I’m all for tools that keep friends connected…how else can my stalking be as sharp as it was when I was a teeny bop? Now, I can even be better! Yeah! 35. Wacky and slightly “annoying” stories! The blog wouldn’t be what it is if I didn’t live in an exotic place and get myself into trouble, now would it? 34. Congee/chao/rice porridge — All in all, a great meal, an Asian comfort food. For me, the best types have oysters, 100-yr old egg, peanuts, chopped green onion, pickled radish, soy sauce and red vinegar etc….they don’t call me Condiment Queen for nothin’! 32. 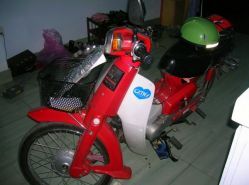 Safety — bright bike lights and helmets do protect on the roads from Hoi An to Danang! 31. Sunshine — despite the tan, Mr. Sun, Mr. Golden Sun, please shine down on me! 30. Lush — no doubt on the list already but I love it! 27. Early morning swims — I could blow those salty bubbles and float in the waves forever! And the outdoor showers! LUSH! 26. Good ol’ quirky grams! She’s so cute and reminds me too much of my dad! 25. Nha Trang, VN — my fave VN city! Really, with the sun, mud baths, seafood, and yummy desserts, you can’t go wrong! 24. Fabulous Cam Duc seamstresses: they are so good, even better (and cheaper) than the town full in Hoi An! 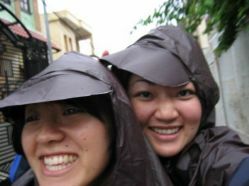 23. the two-headed poncho and rain boots that I’ve picked up for stormy DN rain: they make riding a motor bike fun! Wanna go for a ride? 22. RAW OYSTERS — great at Toyko Ichiban in Richmond, Canada but even better in Nha Trang, Vietnam! One big dish for just $1.50! And five minutes from my house in DN, we’re grilling them on the beach! 21. Great friends (esp. the trilinguals) — It’s amazing who you end up meeting when ur far away from home! 20. Your own space — seriously living alone outside of a dorm or hotel is wonderful 🙂 I even like the ants! 1. Peter, my blog master. Without him, there’d be no blog for me to share with my friends so merci mille fois, Monsieur PK! 2. Languages and phrasebooks = I love them! 3. Book clubs — Seriously, start your own and you will discover a greater joy to life! 4. Visitors to Asia while I’m there….hint hint 😉 I don’t mind if you use me for my apartment, really! 5. Tomatoes ( if you do not agree, leave this blog NOW!) and other mentionables like eggplants, garlic, figs, and cherries! 6. Lush products: ladies and men, get thee to a Lush store and sign up for a Lush party tout de suite! Check out my fave sites to get Luscious today! 7. 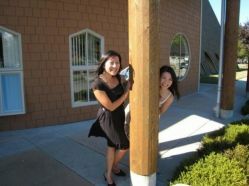 Family : with my little Celly and Princess Anh, how could I not be pleased? 8. Textured foods : tobiko (fish egg) sushi, jellyfish, soursop, organ meats (sorry guys! ), ribs n cartilage, dim sum esp. at Floata in Chinatown and my favourite exotic fruit, the lovely rambutan or spider fruit as they’re known in my family. 9. Left-handed ppl : this should actually go higher on the list so please join my left-handed union. Current members include me, my bro (he hasn’t officially joined), and Flanders from The Simpons. Newsflash: Elton John is also left-handed! 10. My improved editing skills: thanks CGA! Without them, my blog would be full of errors and inconsistencies. 11. My happy-thoughts calendar which is the best gift ever — given to me by Sheldon who not only contributes to my bad jokes but is thoughtful too! 13. Earplugs for the plane: I used them for the first time and they really made a HUGE difference. Thanks for the tip, June! 16. Beaches in Vietnam: you must experience them for yourself! Ahhhhhhhhh! Even after a typhoon, they’re still warm, sandy and amazing! 18. Earplugs part II: they’ll save you as the monsoon rains pour down! And trackpants too! This is the first time I’ve read this page and I didn’t know you called me Princess! But I am too dainty for some things, like playing soccer in the muddy rain!